The locals of Door County, Wisconsin, sit across from me at the picnic table, dumping a colossal amount of melted butter over their plates, rendering their meal balanced to Wisconsin standards. The most important food group is dairy, I’m told, and until now this meal has been severely lacking. Welcome to the Door County-style fish boil, a relic from the Scandinavian heritage of the cheese-head peninsula. What’s a fish boil, you ask? It’s Wisconsin’s answer to the New England Clam Bake, or the Deep South’s Alligator Fry (that’s a thing, isn’t it?). The mere mention of a fish boil makes Door Countyians squirm with excitement as they conjure images of summer days. And pyromaniacs, rejoice. Because this meal involves fire. Lots of it. Door County is a peculiar place. A peninsula sticking out into Lake Michigan, during the first few days of visiting there it seems like the archetypal summer vacation spot. And it partly is. The weather is pleasant, with a consistent breeze stemming from the open water of Lake Michigan to the east and Green Bay to the west. Small towns — where all people seem to know each other — dot the county, and each hosts old-fashioned kitsch ice cream shops, lakeside kayak rentals and frequent sidewalk sales. Independent galleries are abundant. There is a forested park, aptly named Peninsula State Park, which overlooks the bay and has a long bike path snaking through it, perfect for an idyllic sunset ride. But there is quirkiness to Door County that reveals itself in the details of a visit. And you see this eccentricity only after it has slipped through the cracks of its touristy façade. To me, the fish boil represents this goofy and somehow nostalgic place. In addition to cheese and fish boils, Door County proffers another tasty food: cherries. No, not the cloyingly sweet cherries muddled at the bottom of your poorly made Old Fashioned, but Montmorency cherries that are tart and rather horrible when eaten off the tree, but delicious when reduced into jam, or made into wine, ice cream or margaritas. They were even the subject of a musical entitled, Bing! The Cherry Musical!, produced by the American Folklore Theatre, one of the few outdoor original musical theater venues in the country. People here like their cherries. But to really experience the essence of a fish boil, throw one yourself. Without further adieu, here’s how—regardless of your geographic location or your affection for cheese. 1) Head out to the nearest lake and catch a few pounds of whitefish. Find the biggest pot you own and fill it with new potatoes, whole white onions and more salt than you think is healthy. 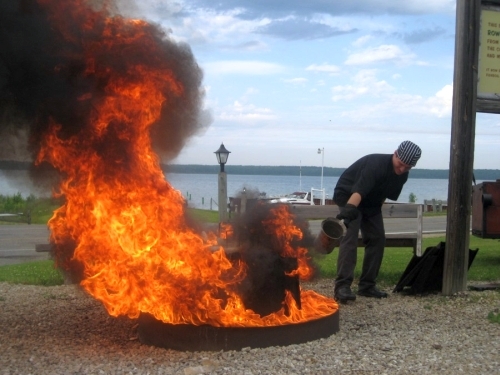 Fill with water and bring to a boil over a massive outdoor fire. 2) Call 20 of your closest friends and break out the tart cherry margaritas. 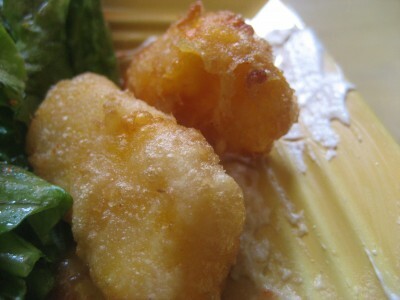 Eat some cheese curds as an appetizer. Appoint a “boil master” — usually the host of the party — to douse the fire with inordinate amounts of gasoline. 3) Taking care not to singe your eyebrows, pour gasoline directly onto the fire. Watch the pot become engulfed in flames. The water will boil up and out of the pot and onto the fire. This is called the “boil over”. Your fish boil is ready. Strain out the fish, potatoes and onions. Serve with extra salt and melted butter. 4) For dessert, serve up the cherry pie. Pair with whipped cream, or if you’re feeling extra Door County-like — more cheese curds. Hey, this is Wisconsin after all.